We are on the verge of the next wave of “Bring Your Own” and it is going to be great for those who embrace it. I call it Bring Your Own Anything (BYOA, of course). It is led by the ongoing data revolution and doesn’t matter if that data is big or small. It is led as well by the people who embrace the new wave of data in their personal lives and demand the same of their workplace. This will rock the boat more than any CIO-led initiative and will have a bigger long term impact than any particular software. I let a sharp 22-year-old talk his way from my front door into my home on Saturday and two hours later, I was the proud owner of an updated, state-of-the-art security system. I had fun all weekend testing out the remarkable new ways that I can control and monitor my home that aren’t that remarkable from a technology perspective but are FINALLY here for the mainstream. For a relatively small fee, I now have the ability to collect data about my home, day in, day out. It keeps track of everything from motion in a particular room to opening and closing of doors and windows. It even snaps a photo of the first movement in the house each day, shown here as my son headed to the kitchen at 6:59 am (awfully early for a teenager to be up). 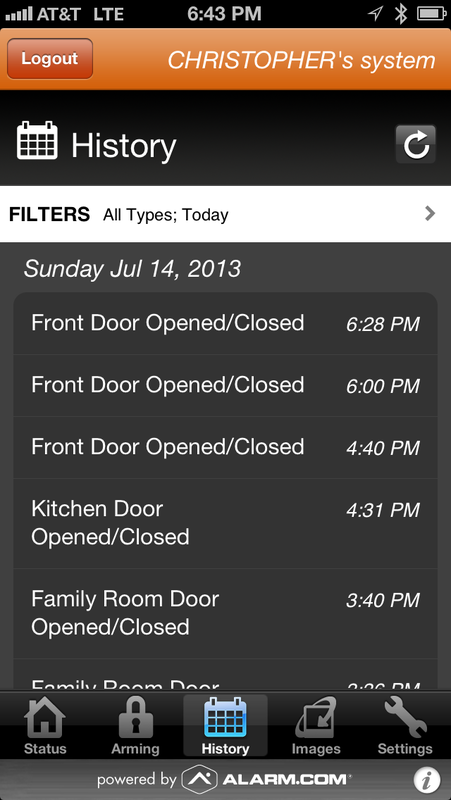 I can add events of any type, in fact, and I can even add a module to manage lights and temperature and I can monitor everything on alarm.com, a best-of-breed iPhone app. It never gets tired and it reports with merciless precision. We don’t have systems nearly so precise in our workplaces simply because this is so new that we’re not building atop any legacy applications…my house was a green fields opportunity for Protection 1. They aren’t burdened by past purchases of technology and their business is simply surprise and delight their customers with more information than anyone thought possible. If only our own IT departments could have it so easy. It’s only a matter of time before we expect and demand the same things from our work systems, where the value is higher and the competition far more fierce than in my kitchen.